Great Quest holds the Sanoukou and Dabia Ouest concessions, constituting the Sanoukou project (Map of Concessions in Western Mali). Great Quest has been working in the prolific western gold belt since 1996 where 8 gold deposits and over 30 million ounces of gold have been discovered to date. Gold mines in the area include the Sadiola and Yatela (Anglogold and Iamgold), Loulo (Randgold) and Segala and Tabakoto (Avion). 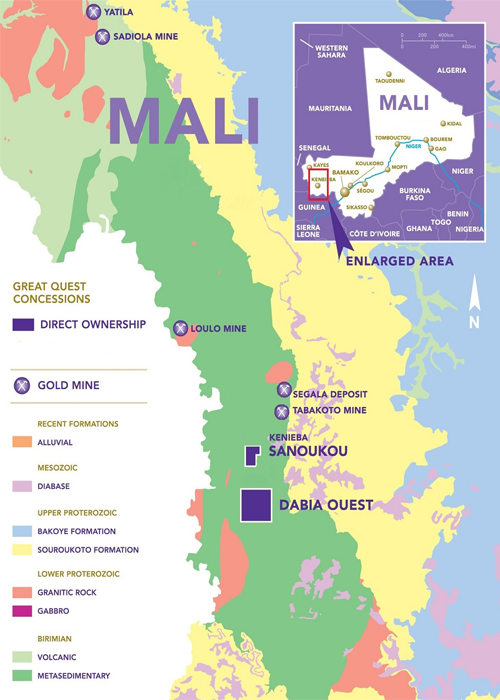 Currently the Company holds the Sanoukou and Bourdala gold projects within the belt.